Please pardon my dust while I am remodeling! Scroll down to read posts! Yea!~ I was one of the lucky blog owners that has been locked out of their blog for almost 12 hours. Finally, blogger and Google have fixed the problem and we are back on. Unfortunately, some blog owners got up today and their blogs were gone. Completely gone. This is why I have spent the past few hours backing up my blog, I was sick today all morning wondering if it was going to happen to me. Fifteen months of hard work would have been just completely gone including my layout and graphics. If you have a blog I would suggest backing it up by exporting it to another site or to an external hard drive. I have been considering going to Word Press where supposedly there are less problems like this. Back in the fall I switched to WP for a week or two and didn’t like it at all. Freaked out a bit and went back to blogger. Blogger has the ability to freeze your blog, and delete it. This has happened to a few bloggers that I know of, at Christmas Hip 2 Save was locked out and Freebies 4 Mom’s blog was completely deleted. I can’t imagine how sad and frustrating. What platform are you using for your blog and if you went to WP are you happy there? I just saw these in my McDonalds yesterday and was reminded of the E.T. and Care Bears ones that we got as kids. I was tempted to even get one because of the memories…. Low and behold, McDonald’s is recalling all Shrek themed drinking glasses. You can go HERE for more details. 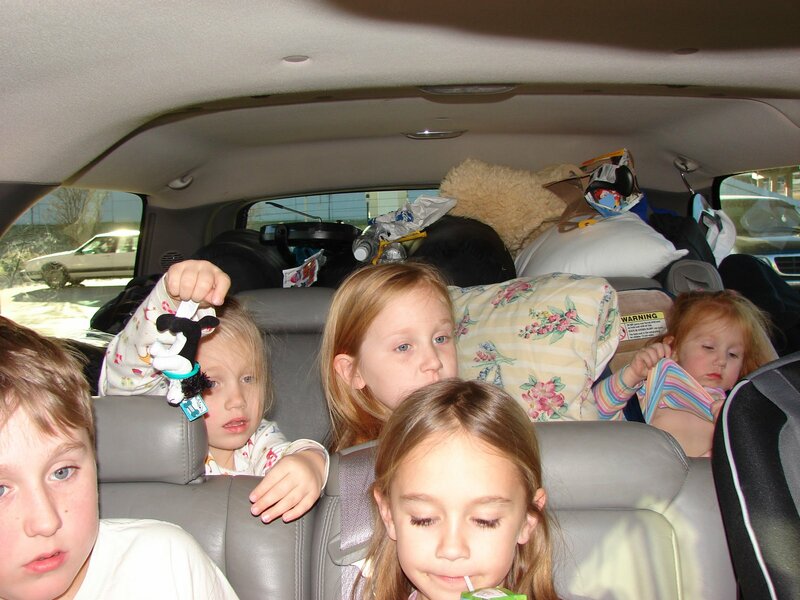 MyLitter’s Tips for traveling with children…. – Pack everything you THINK you might need and see if your husband can fit it all in. – Always bring very messy snacks, like sticky candy and powdered donuts. – Never underestimate how often a 3 year old needs to pee, and never try to call her bluff. – Pack the diapers and wipes together in the bottom of a suitcase and pack it first so it is hardest to get out. – #1 thing to do, forget your glasses so your husband has to do the ENTIRE drive by himself while you play on the laptop. Tips for getting a hotel with 8 people. – There is a reason they charge $39.99 a room. Fork out the extra $20 for the $59.99 and you might get clean towels. – Always say, “It’s just my wife and kids” they never could imagine you forgot to tell them about the “other” 4 kids that will be sharing the room also. – Get 2 queens not 1 king. The king only invites ALL the kids to sleep with you. – Bring sleeping bags and make the big kids use those. 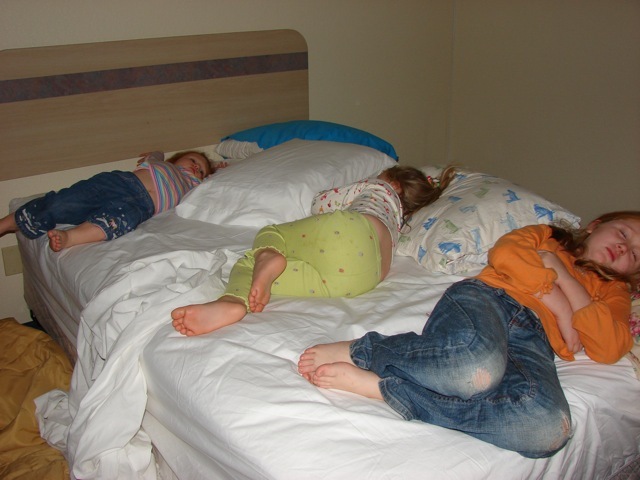 – Lay all 4 girls the wrong way on the bed… you can only fit 2 the correct way but if you pack them in like sardines you only have to bring in 2 sleeping bags. Hey, their small, and they still think it is fun to be uncomfortable all night. – NEVER let the baby play with the remote. This is a hotel/motel you never know what channels they have. The 1 year old might flip to something COMPLETELY inappropriate with all the kids watching while Mom is in the bathroom and Dad is cleaning out the car…. They also charge you for the remote when it magically disappears and you can’t return it to the front. UPDATE: Coupon insert his weekend! UPDATE: There will be a small General Mills coupon insert in SOME papers this weekend. I have not found a list of the coupons that it will contain…. I am still looking. I would take a look while in the store at the coupons to see if they are worth buying the paper for. What to do with expired coupons. I have read in the past about programs that can distribute expired coupons to members of the military. They are allowed to use expired coupons 6 months past the expiration date. Thanks to an email from my friend Heather O. she gave us an address to send them to. There are some “rules” to the way they want them sent, so please go here to find out more details as well as which military base to send them to. This is one small way that we can help our military families. 1. Send coupons that are just a month or two past their expiration date, since it takes time to ship, sort and distribute to personnel. 2. If possible, try to sort coupons into smaller envelopes in the same categories you would use. At the very least, sort them into FOOD and NON FOOD if possible. **PLEASE sort the coupons into categories before shipping them to Donna. The great news is that she’s getting lots of coupons and has sent out over 8 packages to military bases in only one month with your help! If you do send her coupons, please consider including $1 to help her defray the cost of postage. For crying out loud!!! 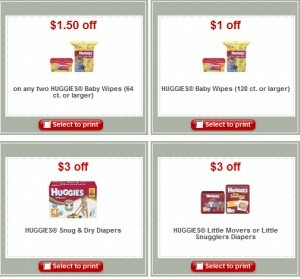 MORE Huggies coupons! 4 Huggies coupons have been added to the Target Website. They are all manufacturer coupons that print with the Target logo, so you can not use them with another coupon BUT…. You should be able to use them at any store, though. Thanks A Thrifty Mom! You can also get a $3.00 Huggies coupon off Facebook, click here to print. Here they are again, and they go fast! 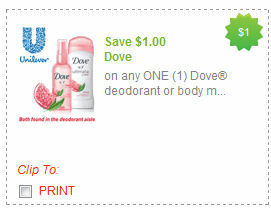 You may want to print this $1 off any one Dove Deodorant, with no size restrictions. Look for the travel size at Target or Walmart , with the coupon to get them FREE! Wow, the deals at Walgreens are good this week…. Well, I am really bummed. in my area we didn’t get this AMAZING rebate! We got a Coke deal instead… but for all of you who did, check your add, you get to buy ANYTHING in the store and get a $10 rebate. Crazy! Spend $15 in a participating Walgreens locations on ANYTHING your heart desires and you’ll be able to submit for a $10 mail in rebate! Yes, you’ll get back a whole $10! This rebate offer is sponsored by Coors/Miller. However, in select states, NO alcohol purchase is required. There are some other restrictions, so make sure to read through all the rebate info in-store. Like I said, this rebate is ONLY valid in select locations. To see if your location is in fact participating, go check your weekly ad here. If the front page of your ad looks like mine (see above), then smile because you get to do this awesome rebate! Let us know either way. Thanks Collin! Head on over here and enter the Rohto Race Training Kits sweepstakes! You could win a bike as well as lots of other goodies. Plus, just for registering, you’ll be able to print a coupon valid for $1 off any one Ironman Pain Management Product! Use this coupon to score FREE Ironman Muscle Rub or Spray at Walgreens! Even another great deal: How about free or almost free razors?! Final cost 2 shavers FREE! **The second $2/1 coupon will most likely beep since the value of the coupon will exceed the value of the item. However, if you have a great cashier, they may adjust the coupon down for you. Final cost ONLY $0.97 for all 6 shavers– just $0.16 each! …AND No beeping! Yay! Here is another great deal from Staples, I never thought about buying toilet paper there! TODAY ONLY, you can score a smokin’ HOT deal on Marcal toilet paper atStaples.com… 24 rolls of Marcal Small Steps Bath tissue for ONLY $4.99 (that’s a whopping 70% off the regular price of $16.99)! But wait, it gets even better. According to Staples customer service, you can place your order at your local Staples store at one of their online kiosks AND use the $2/1 Marcal coupon from the 4/25 SS making the final price only $2.99 (that’s only $0.13 per roll)!! If you don’t have the $2/1 newspaper insert coupon, you can still print a $1/1 coupon found here making the final cost only $3.99! You can also snag FREE shipping if you choose to ship your purchase to your local Staples store! If you would prefer to order online, be sure to go through ShopAtHome! You’ll get 3% Cash back from your Staples.com purchase! Just go on over here and login or register, then in the search box type in Staples. Plus, new ShopAtHome members will receive a $5 cash back bonus after they make their first purchase– which means FREE toilet paper! Thanks SD!